Conor McGregor sat on his stool after 15 minutes of warfare with Nate Diaz, sucking wind. Five months after getting finished by Diaz at UFC 196, McGregor was staring a second-straight loss in the face after surviving an onslaught from Diaz in the third round, similar to the flurry he used to finish McGregor in March. 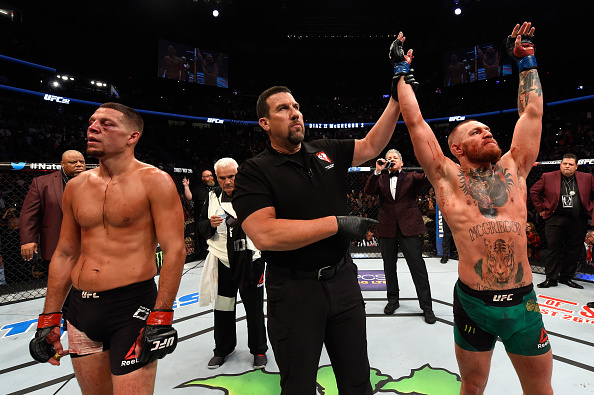 McGregor regrouped and recaptured the momentum, and, eventually, a majority decision victory (48-47, 47-47, 48-47) to draw even with Diaz at one win apiece. In true McGregor fashion, McGregor grabbed the mic to publicly reclaim his thrown. McGregor-Diaz 3 will be out of this world when it does happen, and it will. But first McGregor has business back at 145 pounds, and interim champion Jose Aldo is waiting and desperate for his own revenge. What does the result of Diaz-McGregor 2 mean for both men? UFC president Dana White made things pretty clear before the rematch – McGregor is going back to 145 pounds to defend his title next. Diaz is only interested in big fights and may be willing to sit out until the trilogy match with McGregor, whenever that may come. McGregor needed this fight. If he truly plans to be a two-division champion he needed to figure out how to react when the chips were down. And he was all in on the flop as the fourth round began. Georges St-Pierre said McGregor had to be willing to have the worst night of his life to win this fight. And as the Irishman limped to the back after his five-round war, he truly understood what the Canadian great meant. Both guys come out of the rematch stronger and more popular. The astonishing stat of a combined 330 significant strikes landed between them is good for second-most all-time in a UFC fight behind, appropriately, Diaz vs Cowboy Cerrone (334). UFC 202 was great top to bottom and the main event was unforgettable. Anthony Johnson is the scariest man on the planet and it’s not even close. “Rumble” put Glover Teixeira to sleep with the first big swing he threw in their co-main event and No. 1-contender clash, then proceeded to call out Daniel Cormier, who was sitting as a witness Octagon-side. Teixeira was KO’d once before – 14 years ago in his professional debut. It hasn’t happened since then and it only took Johnson 13 seconds. The last time Johnson faced Cormier he sent the champion halfway across the Octagon, but the “King of the Grind” out-worked Johnson after that to secure a submission win. The rematch must happen and it now looks more likely than ever before. Just eight short months removed from the most devastating loss of his career, Donald Cerrone has put together another win streak and is sitting pretty with plenty of options ahead of him. Cerrone is faster at 170 pounds and it showed once again against Story, as the former lightweight title contender kept him guessing with kicks and punches before landing the impressive final series to finish the fight. Two years ago Cowboy welcomed Eddie Alvarez to the UFC by beating him by unanimous decision at UFC 178. Now Alvarez has the lightweight title, and despite his success at welterweight, Cerrone has unfinished business at 155 and wants Alvarez next in New York City for the lightweight title. Cody Garbrandt may be just four fights into his UFC career, but his battle with veteran Takeya Mizugaki was pressure-packed for the bantamweight rising star. “No Love” has been talking a big game in recent months and has set his sights on champion Dominick Cruz in hopes of securing a title shot for the bantamweight championship. After the win Garbrandt called out Cruz, who was sitting in his seat in the FS1 announcing booth. Cruz seemed game for the fight. After Lorenz Larkin finished teeing off on Neil Magny’s left leg with leg kick after leg kick, he delivered a message to the rest of the welterweight division: He wants big fights. Larkin now has three KO finishes at 170 pounds and he became the first man to finish Magny by KO in his 15 career UFC fights. A significant jump in the rankings should be coming for Larkin next week when the official rankings are released. He now places his name in the mix of the Top 10 of a stacked 170-pound division, but with his power and takedown defense he could be serious problem for the rest of the division.